“Preacher” kicks off on AMC this Sunday, ending the decades-long struggle to adapt the Garth Ennis & Steve Dillon graphic novel to the screen. But what everyone’s talking about is the violence. The show has an epic fight scene on an airplane that shows one guy getting impaled with a champagne bottle. One woman chews off a man’s ear. Bones are broken, blood is splattered. And this is a series about a clergyman. From executive producers Seth Rogen and Evan Goldberg, the series stars Cooper as Jesse Custer, a West Texas preacher with a mysterious past. After a supernatural experience, he sets out with his ex-girlfriend Tulip (Ruth Negga) and Irish vampire Cassidy (Joseph Gilgun) to find God and ask him to explain himself. The graphic novels were just that–graphic–featuring scenes of violence that were often used for dark comedic effect. The TV adaptation doesn’t shy away from the violence at all, using it to underpin the more serious and silly moments on the show. 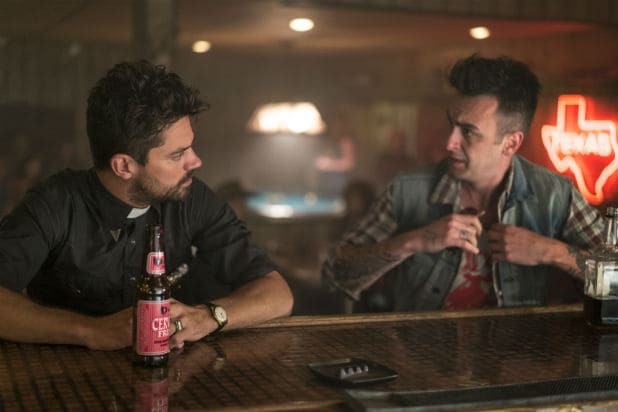 And while the show also deals with many questions of faith and the Almighty, but neither Cooper nor Gilgun had any religious experiences onset. In the midst of all the gore, Gilgun stands out for his portrayal of the hard-drinking bloodsucker Cassidy. “Preacher” premieres on Sunday at 10 p.m./9c on AMC. 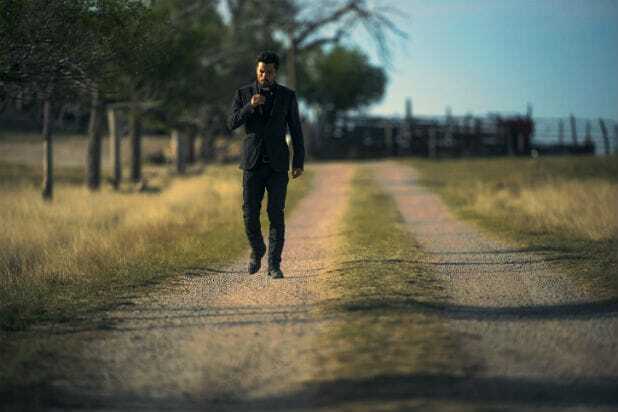 Dominic Cooper struts his stuff as Jesse Custer, the titular preacher. Lucy Griffiths plays concerned church-goer Emily, newly created for the TV series. Anatol Yusef and Tom Brooke look worse for wear as fallen angels DeBlanc and Fiore, former bureaucrats in Heaven who are exiled to earth. Derek Wilson looks surprised in a bathroom as Donnie Schenck, a preacher himself in the comic whom Custer beats within an inch of his life, forcing him to leave town. His promotion to series regular forecasts an expanded role for the character.